Of the fungus, that is. Not yourself! Another feature to consider when identifying mushrooms is whether they bruise or bleed a specific color. Certain mushrooms will change colors when damaged or injured. Cutting into a mushroom and observing any color changes can be very important when trying to determine what it is. Please note that color change alone is one of the least reliable ways to go about mushroom identification. There are always variations, and color changes may not be trustworthy depending on the age of your fungus. Use mushroom bruising as just another tool in your identification arsenal. Let's examine identifying mushrooms through bruising and then through bleeding. We'll end with a quick list of some well-known examples. For more mushroom identification features, see this page. While identifying mushrooms, check for bruising by nicking the top and bottom of the cap and watching for any color change. Try this within 30 minutes of picking, as specimens that are not fresh won't give a reliable result. Note the blue/black spot on the underside of Boletus queletii to the right. The discoloration is due to bruising. It looks like someone pressed a finger into it. Why does this happen? The color change is caused by a chemical reaction that occurs when certain compounds in the cell walls of the mushroom are exposed to air. Once you nick the cap and break the cell walls, oxygen in the air mingles with these compounds and changes them. Take Gyroporus cyanescens for example. When exposed to air, the variegatic acid in this mushroom is converted to the blue-colored molecule quinone methide. There are many famous blue-bruising mushrooms. 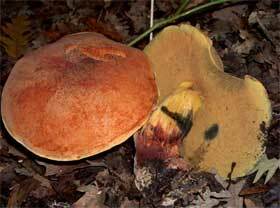 A common rule for boletes is that you shouldn't eat one that has a red pore surface and bruises blue. Because so many blue bruising boletes are poisonous, it's best to avoid them altogether. Some people think that all blue bruising mushrooms are safe to eat or are hallucinogenic. The bolete rule above proves that is not true. This myth is an example of why identifying mushrooms through bruising alone is a bad idea! Certain mushrooms will exude a milky liquid substance when they are cut. This is not real "blood" of course but natural latex that's produced when the mushroom is injured. The exact reason for the latex is not fully understood. It is believed to be a method of defense, due to its bitter taste and the fact that it dries to form a protective coating around the injury. This keeps out bacteria and other contaminants. Some of the most famous bleeding mushrooms are those in the Lactarius genus. These are called the milky caps due to the milky latex they exude upon injury. 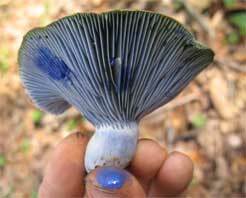 An example is the blue bruising and bleeding Lactarius indigo, the indigo milk cap. When cut, this mushroom bleeds bright blue latex that slowly turns green. You can see some of this fluid on the thumb in the bottom of the picture to the right. If you're observing any bleeding during mushroom identification, be sure to note both the initial liquid color and the final dried color. These will sometimes be different. Agaricus bisporus (white button mushroom) - Usually bruises pinkish. Stick your thumb into a grocery store-bought one to test. Boletus campestris - Bruises blue or blue-green. Many yellow-pored boletes bruise blue. Psilocybe cubensis - The stems bruise blue or blue-green. This is a hallucinogenic mushroom, but note that not all hallucinogenic mushrooms bruise blue. Russula rubescens - Bruises reddish, and then slowly turns to black. Mycena haematopus - Bleeds purplish. Lactarius helvus (maple syrup milky cap) - Bleeds colorless latex that smells like maple syrup. Lactarius chrysorrheus - Bleeds white latex that dries to a deeper yellow. So the next time you're identifying mushrooms, don't forget to check for bruising and/or bleeding. While no identification guarantee, it can be an important piece of information! The first picture was taken by B.Baldassari and is published on Wikipedia under the GNU Free Documentation License. The second picture was taken by Alan Rockefeller and is published on Wikipedia under the Creative Commons Attribution ShareAlike 3.0 License.